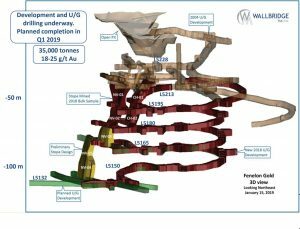 QUEBEC – Underground and surface drilling yields results for Toronto-based Wallbridge Mining Co. at its Fenelon gold project 75 km northwest of Matagami. The results are high grade – up to 144.77 g/t gold over 6.1 metres – but the program also resulted in the discovery of a new visible gold zone at depth. The foregoing intersection was drilled underground into the Habanero zone. Here are some more underground results: 9.12 g/t gold over 7.0 metres including 24.63 g/t gold over 2.5 metres in the Naga Viper zone; 25.24 g/t gold over 9.3 metres including 125.44 g/t gold over 1.8 metres in the Habanero zone; 10.39 g/t gold over 4.5 metres in the Chipotle zone; 39.28 g/t gold over 1.7 metres in the Naga Viper zone; and 49.21 g/t gold over 2.2 metres in the Paprika zone. Surface drilling has so far returned these assays: 4.70 g/t gold over 3.0 metres in the Habanero zone; and 29.90 g/t gold over 1.0 metre confirming the high grade nature of this deep intersection of what is most likely the depth extension of the Tabasco zone. Wallbridge says it was hole FA-018-051 that returned visible gold in a potentially new zone at a vertical depth of 380 metres. Assays from 12 underground and 15 surface holes are pending. Bulk sampling (35,000 tonnes) is currently underway at Fenelon, and the company plans to start gold production later this year. The 2019 drill program – 50,000 to 75,000 metres – will commence in early February with mobilization of at least one underground and one surface drill rig. Details of Fenelon past and future drill results are available at www.WallbridgeMining.com.